Two laser modules mounted onto Revolver Gun air defense turrets made by Oerlikon and attached to additional power modules. 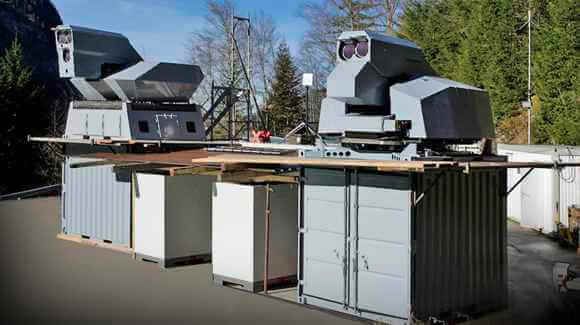 The laser modules are 30 kW and 20 kW, but a Beam Superimposing Technology (BST) combines two lasers to focus in a “superimposed, cumulative manner” that wreaks havoc on its targets. First, the system sliced through a 15mm- (~0.6 inches) thick steel girder from a kilometer away. Then, from a distance of two kilometers, it shot down a handful of drones as they nose-dived toward the surface at 50 meters per second. The laser’s radar, a widely used system called Skyguard, was capable of tracking the drones through their descent up to three kilometers away. After successfully testing their 50kW laser system, Rheinmetall Defense has its sights on a truck-mounted mobile system with 100kW of metal-slicing power. For its finale, the laser’s ability to track a very small ballistic target was demonstrated. It honed in on and destroyed a steel ball 82mm in diameter traveling at 50 meters per second. The small ball was meant to simulate an incoming mortar round. German Military Laser Destroys Targets Over 1Km Away | Singularity Hub.